Triangle's Trip to the State House! - Triangle Inc.
Home » Blog » Triangle’s Trip to the State House! Triangle’s Trip to the State House! The ability for Triangle, Inc. participants and staff members to step away from their busy daily lives in order to represent the organization on a state level is a thrilling honor and opportunity. On Wednesday, January 23rd, more than 30 participants and staff members from various Triangle sites in Salem, Randolph, and Malden proudly participated in the ADDP (Association of Developmental Disabilities Providers) Legislative Luncheon at the Massachusetts State House. The event honored ADDP’s two awardees of the Distinguished Legislator of the Year Award, State Representative Paul Brodeur and State Senator Joan Lovely. ADDP, a strong partner to Triangle, strives to promote and ensure the strength of community-based providers, so that their members can be successful in improving the quality, access, and value of the services they provide. The annual luncheon is an opportunity for legislators, people with disabilities, and community members to come together and acknowledge local lawmakers who are allies and advocates. Triangle was proud to play an important role in the festivities, with program participant Brady and staff member Tanisha giving remarks on all of the skills that Triangle provides to individuals with disabilities, including community exploration, travel training, and employment. Brady and Tanisha gave moving firsthand accounts of how Triangle’s innovative community-based employment programs have empowered individuals to lead more independent lives. Brady, a Triangle participant since he was 19, reflected on his two jobs and remarked that Triangle was like a family to him. Tanisha, Brady, and the Triangle community in the audience represented the organization with pride! 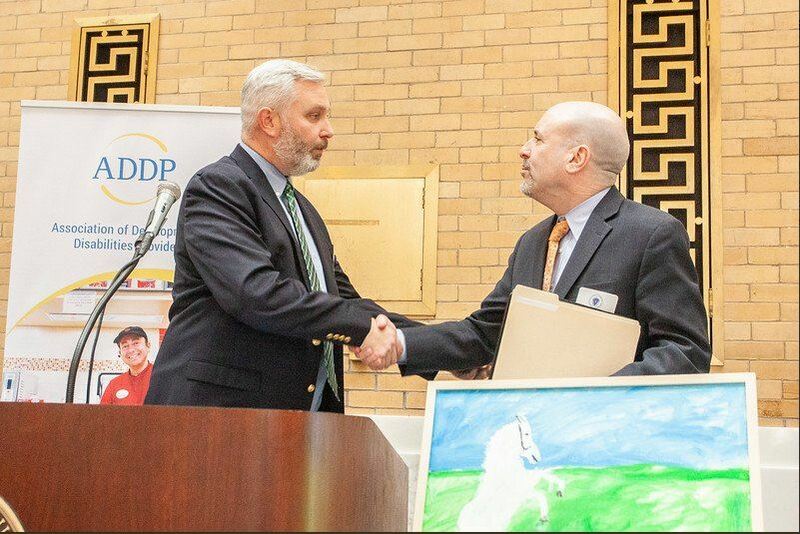 Triangle CEO Coleman Nee had the honor of presenting ADDP’s award to Representative Paul Brodeur, a tireless advocate for the individuals with disabilities in his district, which includes Melrose and Malden. Representative Brodeur, the House Chairman of the Joint Committee on Labor and Workforce Development, continues to support legislation to aid developmental disabilities providers. His steadfast dedication endures through the authoring of legislation that would offer local law enforcement training on how to best and most effectively interact with individuals with autism. We’re lucky to have such a strong ally representing our community! It was also a happy coincidence that State Senator Lovely also received an award at the event. Sen. Lovely received Triangle’s 2018 Public Official of the Year award this past May and hosting Triangle participant, Raymond, as an intern at her office. Having the ability to participate in such an important local event is an honor, and we’re thankful to ADDP for providing us with this opportunity! « A Triangle Holiday Season!